AvCanada's free job forum. Please read the first topic in this forum to learn how to post a position opening. Levaero Aviation is the exclusive Canadian Pilatus PC-12 and PC-24 Authorized Sales & Service Centre, providing exceptional maintenance services to our customers from around the world. Our customers travel to Levaero for our unparalleled quality service and support. 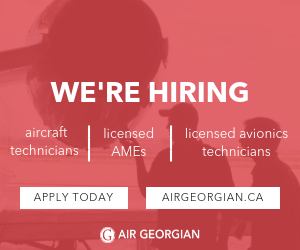 Consider becoming an integral part of our extremely reputable team of aviation professionals. Professional Pilot magazine ranked Pilatus and the Pilatus dealer network #1 for product support for 17 consecutive years. We are very proud to be Pilatus Class. This is a full-time permanent position based in Thunder Bay, Ontario. Located along the north shore of majestic Lake Superior, Thunder Bay offers a high quality of life with a world class waterfront, impressive entertainment district, front door access to Canada’s beautiful wilderness, hiking, mountain biking, arts & entertainment, camping, fishing, hunting, skiing… and so much more. As a minimum, applicants must have a valid Transport Canada M1 category AME licence. Preference will be given to those applicants with previous Pilatus PC-12 and/or other modern turboprop and turbojet aircraft experience. A valid Transport Canada M2 category AME licence would be an asset. •	A fantastic career experience! Wages range from $24.50 to $37.41 plus premiums and are commensurate with experience. Relocation compensation is available subject to certain conditions. You may also apply directly on our website at www.levaero.com and visit the ‘Careers’ section. We thank all applicants; however, only those selected for an interview will be contacted. No telephone calls please.